As the adage goes, “A way to a man’s heart is through his stomach.” This rings true for my husband, as our dates are always centred around a hearty meal. While we don’t usually celebrate Valentine’s Day, we do make it a point to eat out at least once a month to simply reconnect. But with Maybank Cards’ 1-for-1 dining deals, we can now pak tor every week, as we save a bomb by paying for just one diner each time! Porta at Park Hotel Clarke Quay is great for a romantic dinner date with your beau. 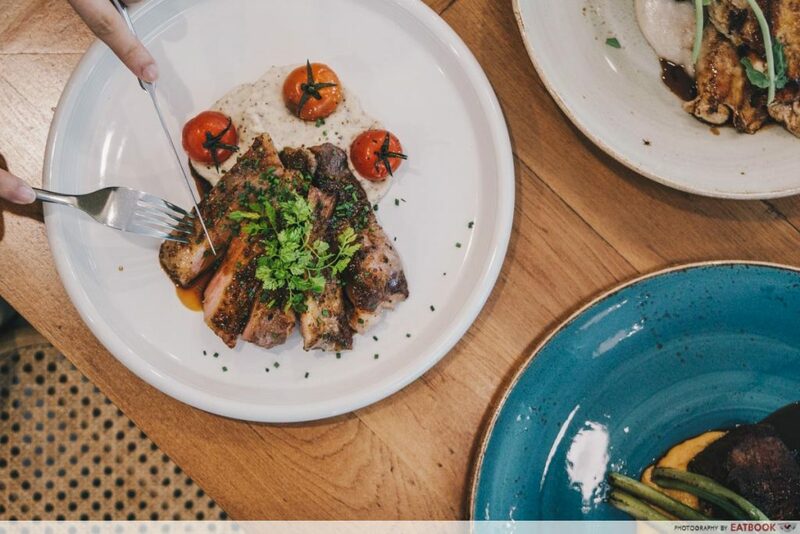 Specialising in European fare, the dishes here are both hearty and delicious. Melt-in-your-mouth tender is the Iberian Pork Secreto ($26++), featuring thick slices of pork shoulder blade with Pommery mustard and a tangy mash. A dish that won’t go wrong is the Spring Chicken ($24++) that comes with a scrummy taro puree and roasted vegetables. 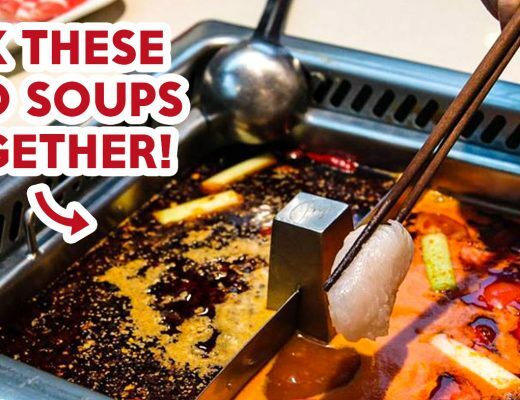 From now until 31 March 2019, spend a minimum of $80 in a single receipt to enjoy 1-for-1 on all meat dishes here! There’s a max of five redemptions per table, so it’s best you pair up with other couples to make dining here more worthwhile. J65 is where you should be, if you’re looking to celebrate your weekend with a feast. 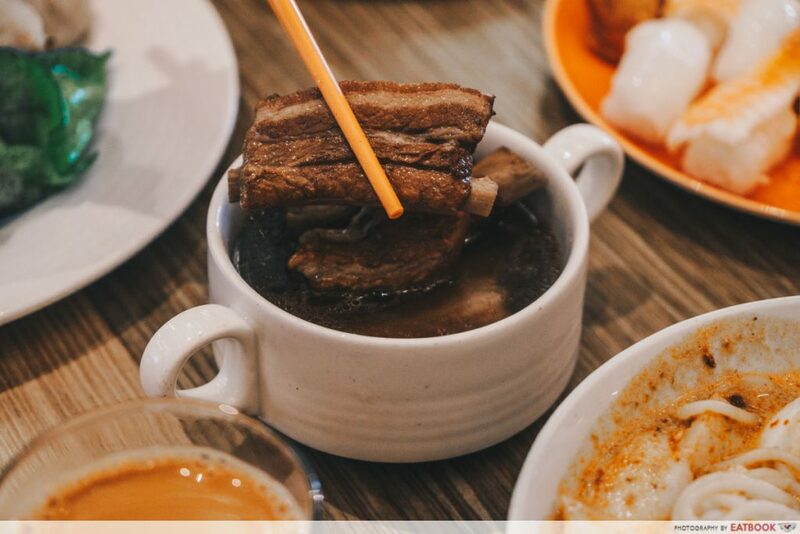 Their Saturday High Tea Buffet ($65++), which starts during lunchtime, features a selection of local favourites such as bak kut teh, nasi lemak, popiah and satay. There’s even a DIY counter where you can build your own kueh pie tee. Thereafter, wash it all down with a cup of their milky teh tarik. 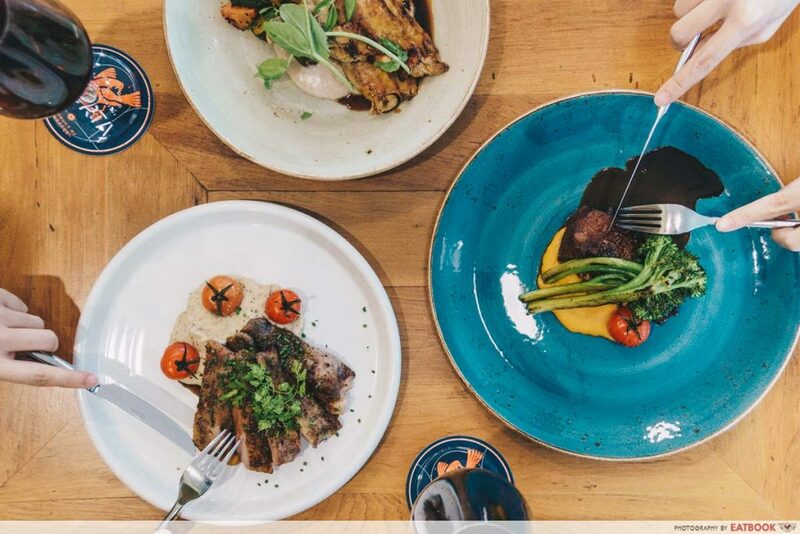 You don’t have to wait until payday to dine here, as you can enjoy 1-for-1 from now until 31 March 2019! Those coming by for their weekday buffets will get 50% off every second diner, up until 28 February 2019. Do note that blackout dates apply on 4, 5 and 6 February 2019. Plan a cafe date with your girlfriend and head over to Fart Tartz. 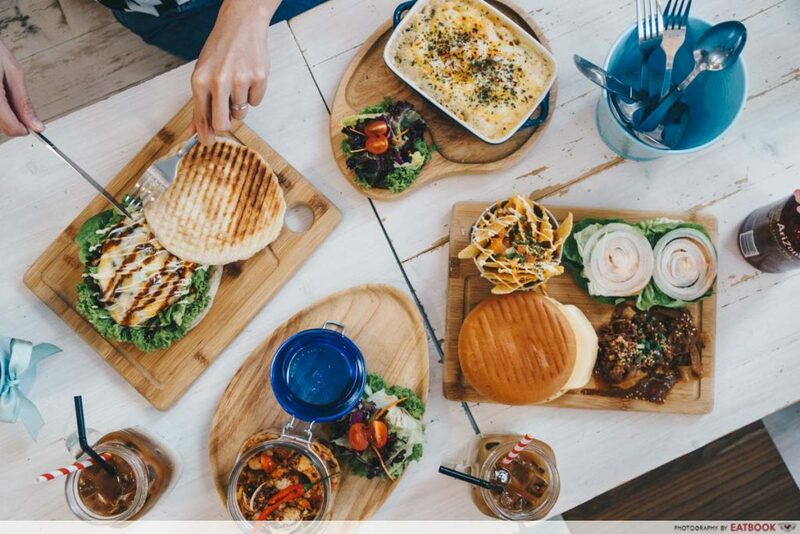 The laidback eatery pushes out tasty eats that will def’ fill you up well. If cheese and pasta are your weakness, then you will love the Pulled Duckie M&C ($15.90). The bold flavours from the duck help balance out the thick layer of creamy cheese, preventing it from being jelak. 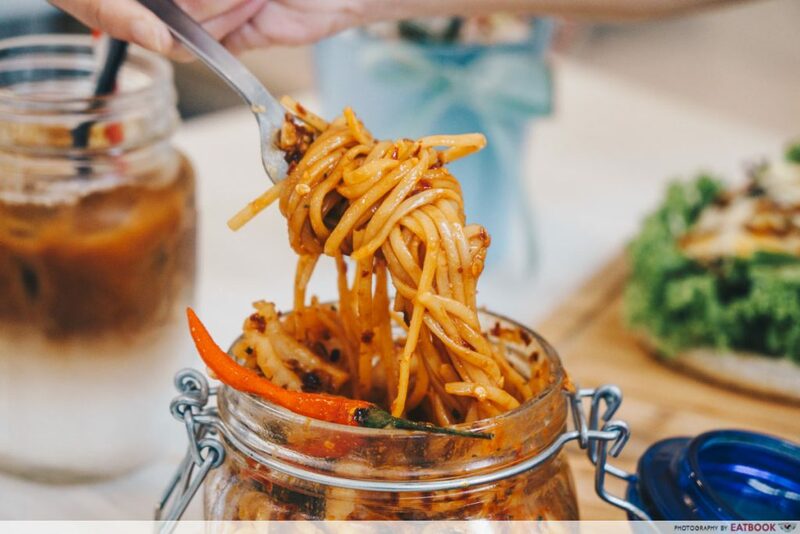 On the other hand, the Sambal Sea Catch ($16.90) is a great option for spice lovers, and features linguine tossed in a fiery sambal olive oil blend. You can rest easy knowing you don’t have to spend a bomb here, as you get 1-for-1 on all main courses. This deal runs all the way until 31 December 2019, so swing by whenever you desire! A one Michelin-starred restaurant for three years, The Song of India pushes out legitimately good Indian food. 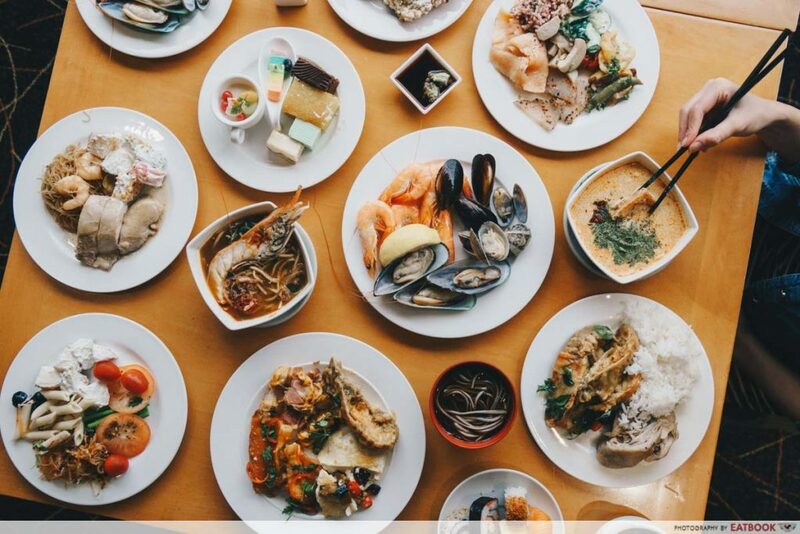 And the best way to sample them all is at their weekday lunch buffet ($36.90++). Here, you will find traditional Indian grub such as Paneer Gulnaar Tikka, Lamb Chop Masala, Mint Fish Tikka and Shaam Severa Kofta. 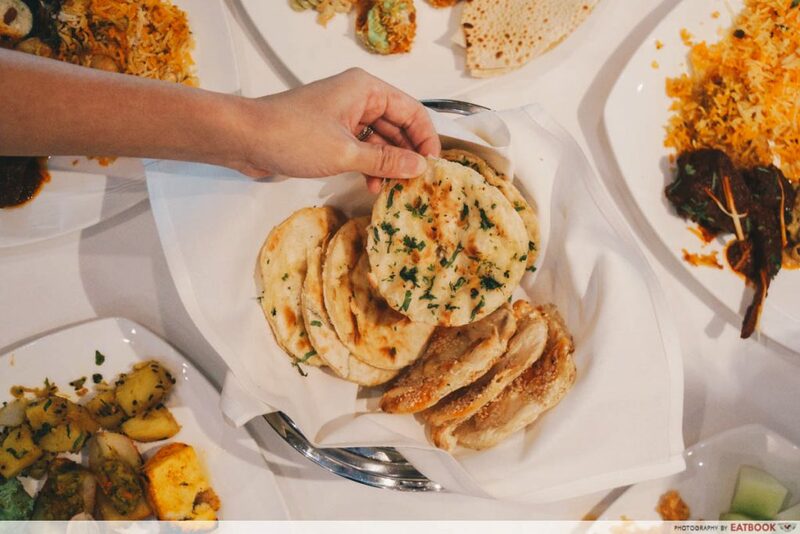 Aside from their fragrant biryani, each table is also given a basket of naan to mop up the curries. 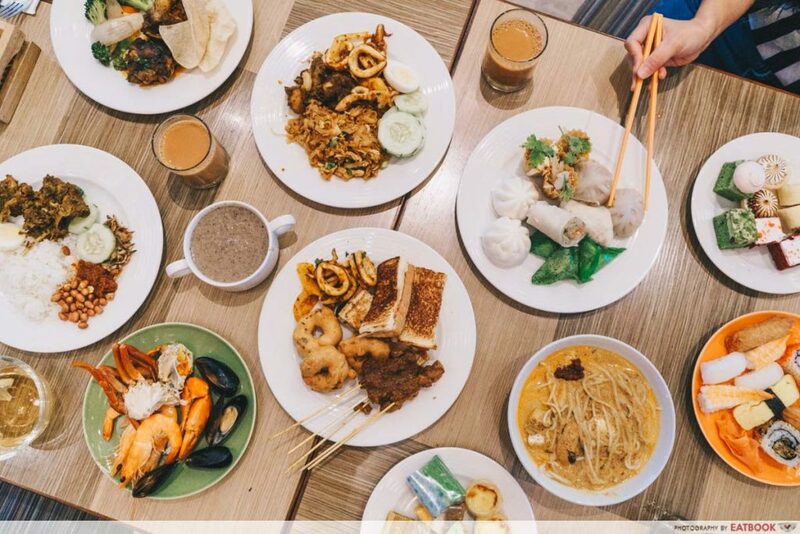 Maybank Cardmembers can dine at this award-winning restaurant without busting the bank, thanks to the 1-for-1 weekday lunch buffet. Plus, they will also cinch 10% off any à la carte dishes ordered! The offer is valid until 31 December 2019, and extends up to a maximum of 10 hungry guests. 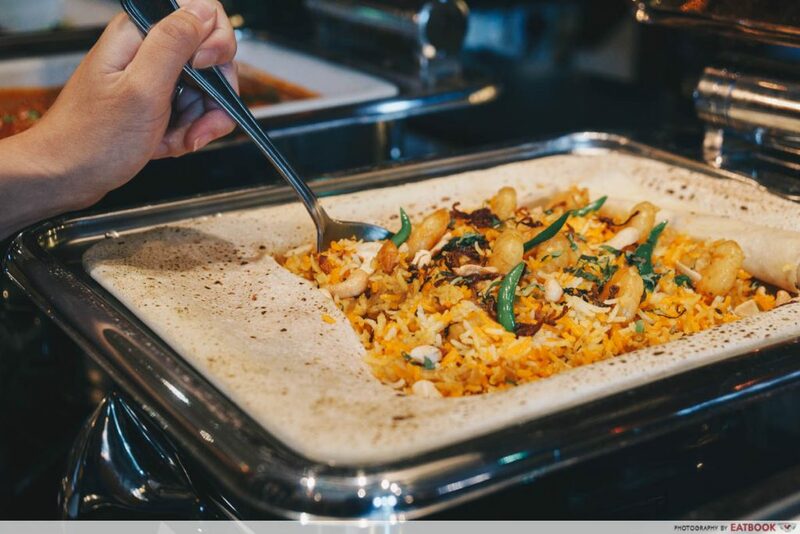 Fuel up on a healthy spread of international and local dishes at The Square. 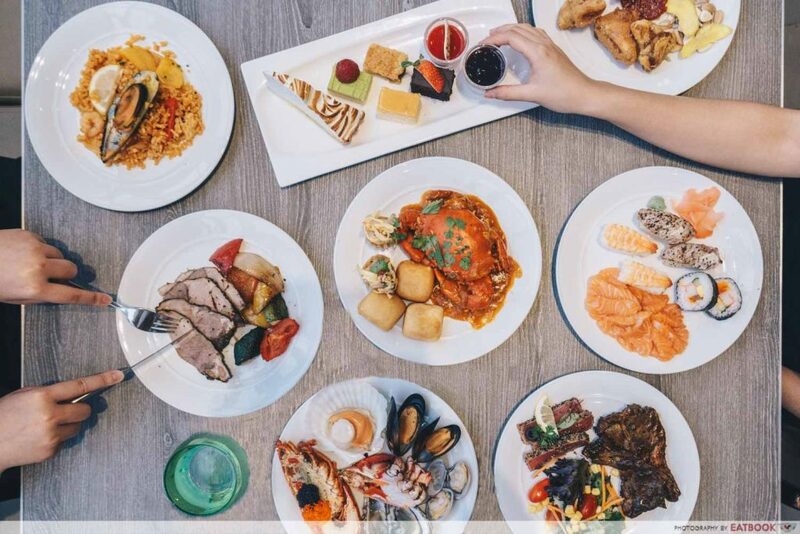 Their lunch and dinner ($78++) buffets are worth every penny, as there are plenty of premium ingredients gracing the line-up. 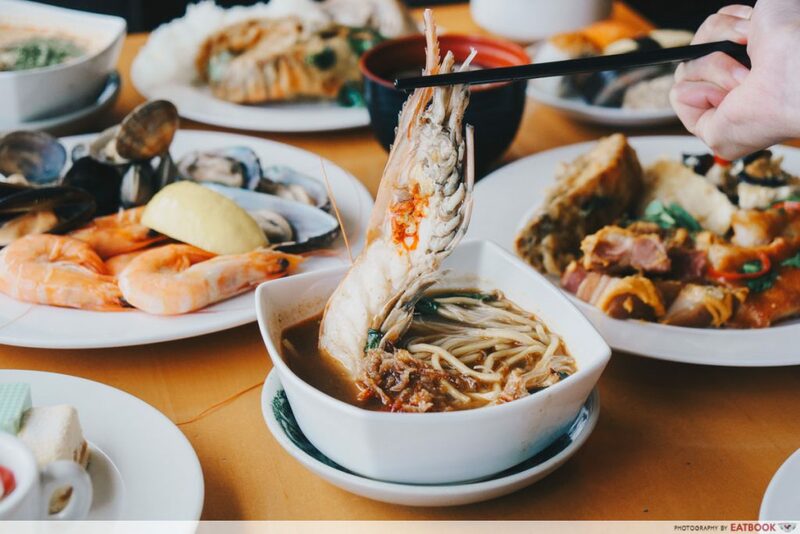 For instance, their piquant laksa features a whole piece of abalone, while their prawn noodles come with a massive crayfish. For those who love snacking on salted egg chips, you will be pleased to know that they also have a moreish wok-fried crayfish in salted egg! 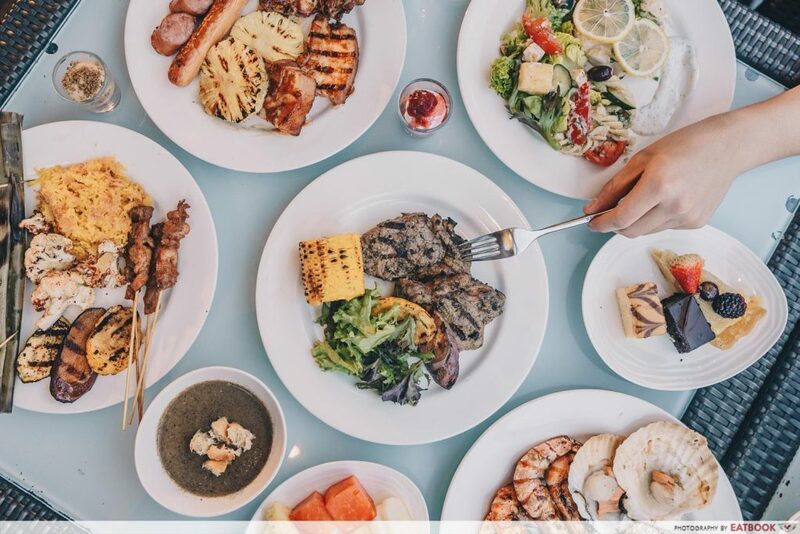 Bring a friend along when you dine here from now until 31 March 2019, as you get 1-for-1 on their lunch and dinner buffets when you pay with your Maybank Credit or Debit Card. Those born in February and March are also rewarded with a complimentary cake on their birthday month, so long as their dinner party has a total of four diners. Gather your squad and indulge in a decadent feast at Atrium Restaurant’s lunch ($58++) and dinner buffets ($88++ for Sun-Thur, $98++ for Fri-Sat). Pushing out a range of international and local nosh, the buffets will be enjoyed by all types of diners. 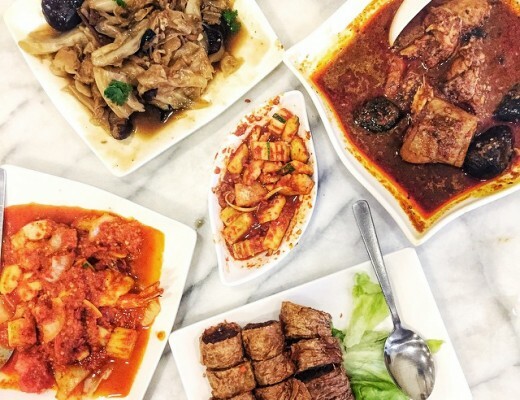 In February, you can look forward to delicious CNY grub such as bak kwa and yu sheng, alongside their signature chilli crab and roasted lamb leg. 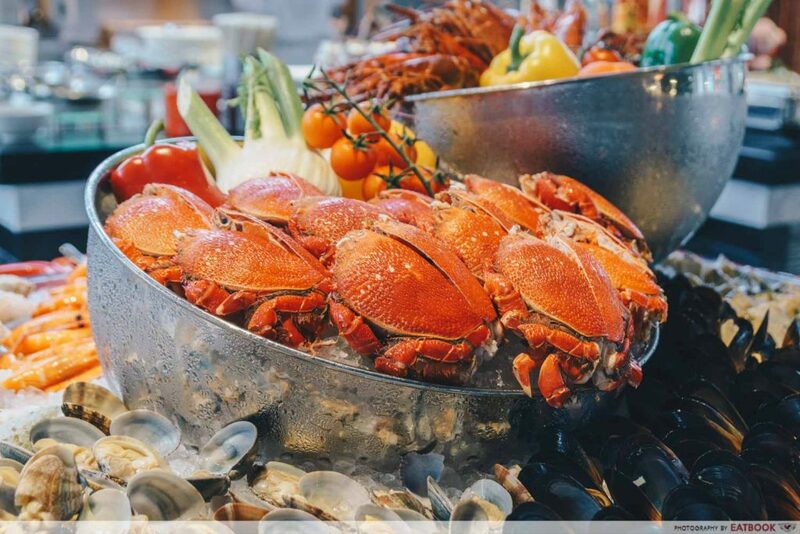 Those settling the bill with their Maybank Credit or Debit Card will receive 1-for-1 on both the lunch and dinner buffet, all year round until 31 December 2019. There’s no limit to how many friends you can bring along, so call along everyone you know! Serving one of the best cheesecakes in Singapore is Cat & the Fiddle. 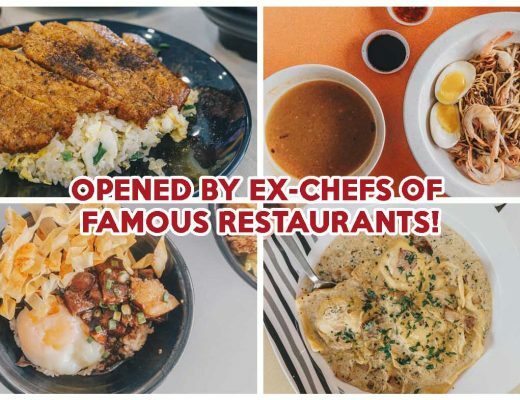 Initially an online bakery, they now have a brick and mortar store in Clarke Quay, where you are able to order a single slice of their cheesy creations! 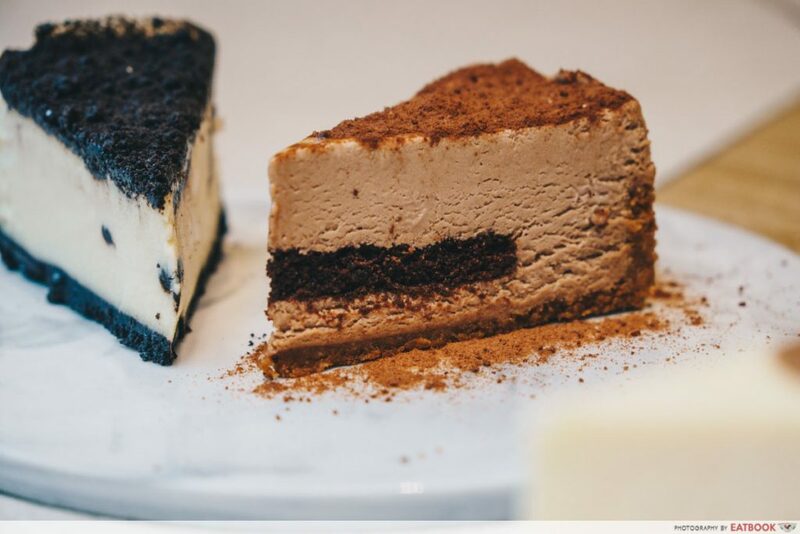 Our favourite is The Modern Duke’s Pudding ($4.90 for a slice, $38.90 for a whole cake), which is essentially an Oreo cheesecake. We also liked the Milo Dinosaur ($5.90 for a slice, $35.90 for a whole cake) that’s covered in Milo powder and features a malty centre. 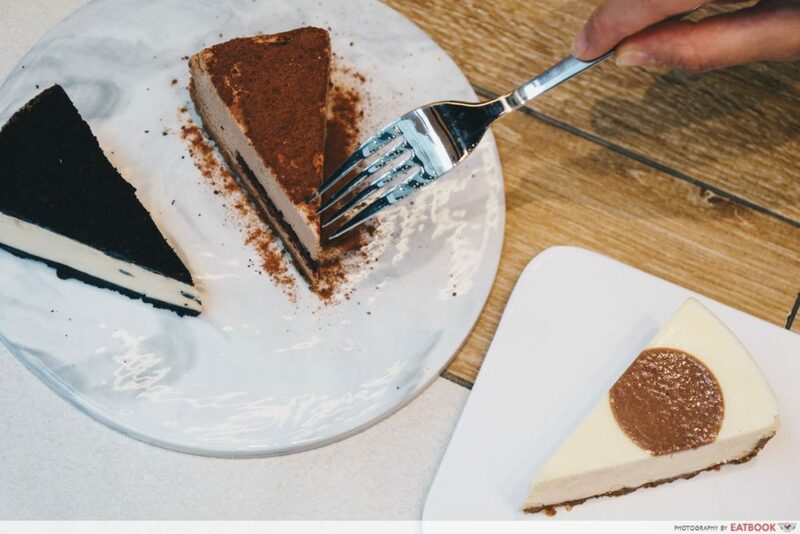 Get 1-for-1 on their sliced cheesecakes when you pay with your Maybank Credit or Debit Card between now and 31 March 2019. There’s no limit to how many cheesecakes you can order, so get all the flavours for your fambam to try! BBQ under the stars at Cocobolo Poolside Bar + Grill. 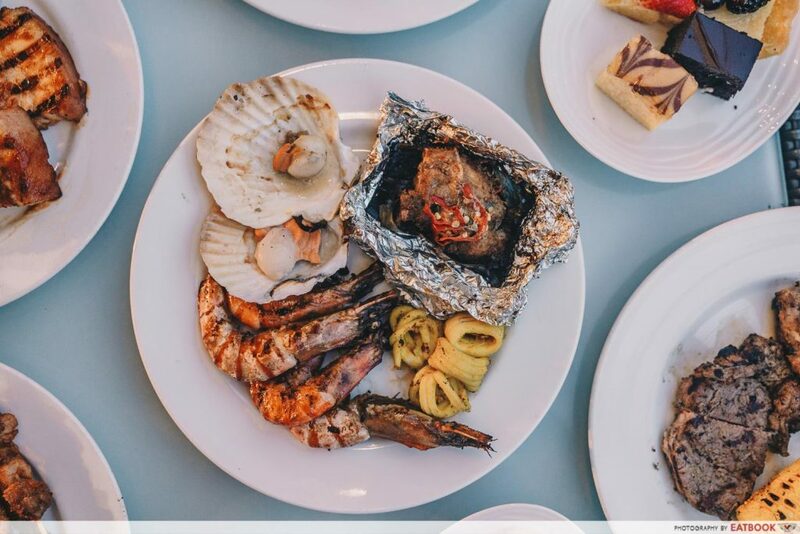 Held only on Friday and Saturday, their hearty Weekend BBQ Buffet ($72++) presents a line-up of tantalising grilled delights. Some items found sizzling on the grill are New Zealand Angus beef, chicken skewers and grilled sausages. 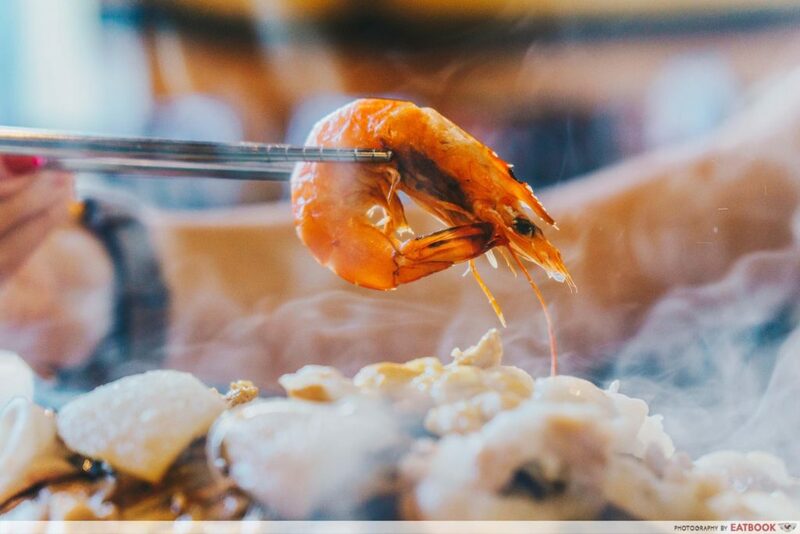 There are also oceanic gems that are char-grilled to perfection, including stingray with spicy shrimp paste and tiger prawns with saffron spices. Make your date an even better one when you pay with your Maybank Credit or Debit Card, as you get 1-for-1 on the buffet until 31 March 2019. Do note that advanced reservation is required, and you would need to buy $20 worth of drinks in a single receipt to enjoy this sweet deal. 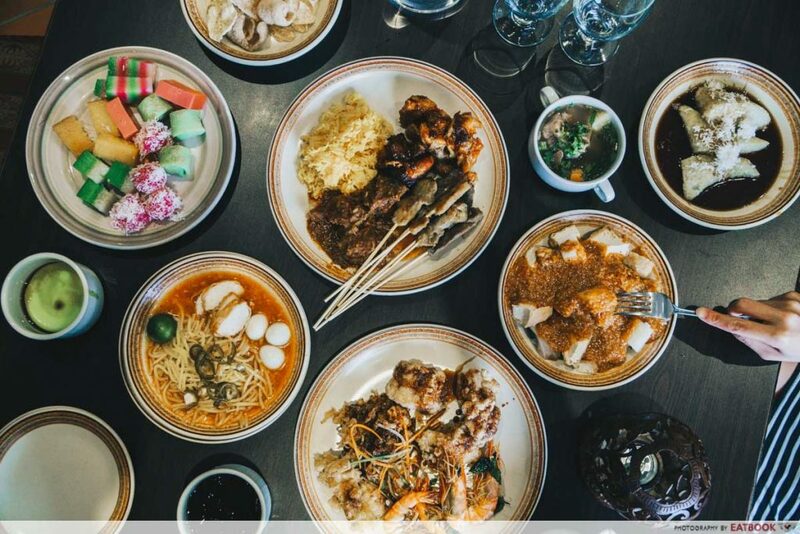 Halal-certified Kintamani Indonesian Restaurant’s lunch and dinner buffet ($65++) presents a bevy of Balinese and Indonesian cuisine that will tease your palate. 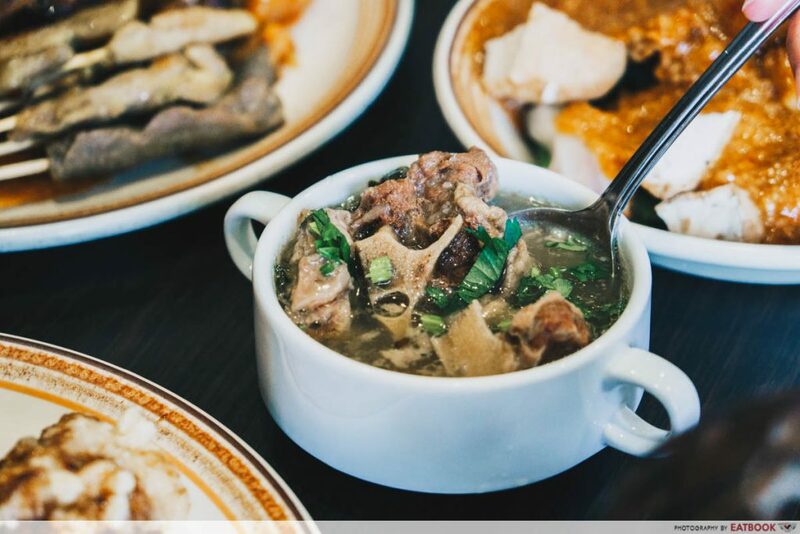 Start off your meal with the Sop Buntut, which features tender chunks of oxtail in a clear yet robust broth. Thereafter, pile your plates high with dishes such as Tahu Telur Surabaya and Mie Kocok Bandung. The latter is a unique noodle dish comprising thick sweet potato gravy. Dining here is cheaper than flying to Bali, especially when you get 1-for-1 on the lunch and dinner buffets! 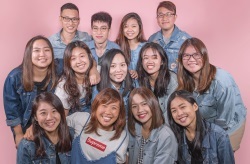 Valid until 31 March 2019, February and March babies can also enjoy a complimentary cake on their birthday month when they dine here with three friends. For my fambam and I, mookata sessions are always a meat-heavy affair. And a place we love to go for this Thai BBQ is Charcoal Thai. 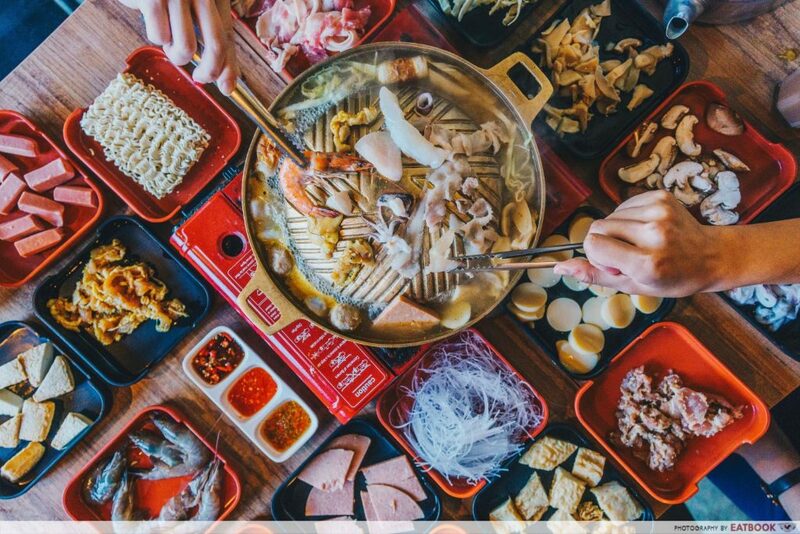 Their Mookata Set ($39.95++), which can feed two hungry people, comprises a selection of marinated meats and fresh seafood. Our favourites are the tom yum chicken thigh and black pepper pork! Maybank Cardmembers can feast to their hearts’ content without breaking the bank, thanks to the 1-for-1 deal on every mookata set ordered! Just remember to quote “Maybank Promotion” upon ordering. Go on a date without busting the bank when you become a Maybank Cardmember! Both Maybank Credit and Debit Cards offer these great deals, so you will def’ find a card to suit your needs. Apply now to receive a complimentary gift**! Alternatively, SMS “MBAPPLY EBA <Name> <NRIC>” to 79898 or visit maybank.sg/applycards for details. If you’re like me and plan your 2019 holiday at the start of the year, then signing up for the Maybank Horizon Visa Signature Card is the way to go. This snazzy card gives you 3.2 air miles (8X TREATS Points) for every dollar spent on dining transactions^. Find out more about the Maybank Horizon Visa Signature Card! ^Dining transactions must be charged at participating Eating Places and Restaurants classified under Merchant Category Code (MCC) 5812. Other Terms and Conditions apply. Visit maybank.sg/hvstnc for full details.